Das Wetter hatten sie auf ihrer Seite. Strahlender Sonnenschein begrüßte die rund 80 engagierten Läufer, die sich am Sonntag am Beueler Rheinufer zum „Lauf für die Menschenrechte“ versammelten. Mit dem von Amnesty International (AI) organisierten Lauf, der bereits zum 16. Mal in Bonn stattfand, wollten die Teilnehmer ein Zeichen setzen. Sie joggten für die Rechte von Journalisten im Iran. Um den Körper trugen sie Schilder mit der Aufschrift „Freiheit für Abedini Nasr“. Der iranische Journalist wurde 2010 im Zuge einer Verhaftungswelle gegen Menschenrechtsaktivisten im Iran verhaftet und befindet sich seitdem in Gefangenschaft, wo er Berichten zufolge auch misshandelt wurde. Iran confirmed Friday that The Washington Post’s correspondent in Tehran has been arrested on unspecified charges. Gholam-Hossein Esmaili, director general of the Tehran Province Justice Department, told reporters that the “Washington Post journalist has been detained for some questions and after technical investigations, the judiciary will provide details on the issue,” the official Islamic Republic News Agency (IRNA) reported. “Iranian security forces are vigilant towards all kind of enemies’ activities, the official added,” IRNA said without elaborating. The brief report did not mention The Post’s correspondent, Jason Rezaian, by name. 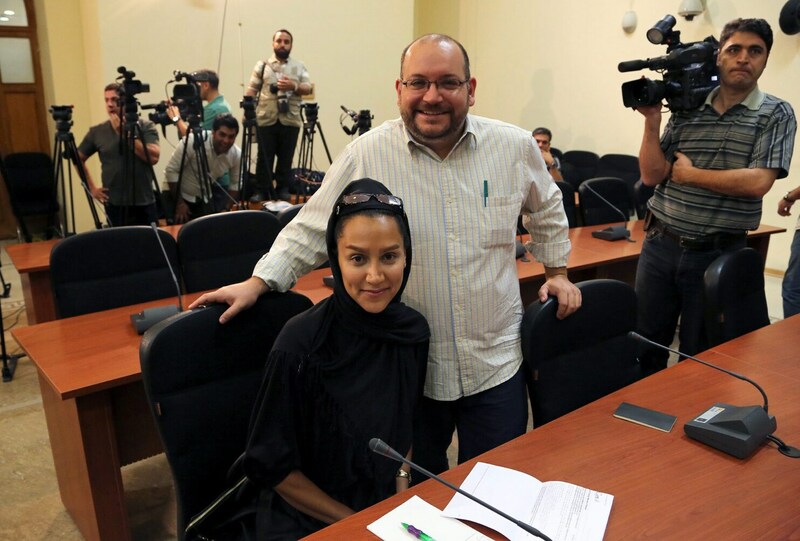 Rezaian, 38, a U.S.-Iranian dual national; his Iranian wife, Yeganeh Salehi; and two other U.S. citizens whose identities have not been disclosed appeared to have been detained this week in Tehran, U.S. officials and The Post said Thursday. Speaking to reporters on the sidelines of annual “Quds Day” rallies, held to express solidarity with Palestinians and oppose Israeli control of Jerusalem, Esmaili shed no light on what prompted the arrests. He went on to denounce”the Zionist regime’s recent crimes in Gaza,” called for the trial of Israeli leaders in international courts and said that “the silence of certain international bodies and states towards Zionist crimes against Palestinians is shameful,” IRNA reported. It was unclear whether those grievances had anything to do with the arrests. Washington Post foreign editor Douglas Jehl said the newspaper received “credible reports” that Rezaian and Salehi were detained Tuesday evening. It was unclear who detained them. “We are deeply troubled by this news and are concerned for the welfare of Jason, Yeganeh and two others said to have been detained with them,” Jehl said in a statement. Die Journalistin Saba Azarpeik, die seit dem 28. Mai 2014 festgehalten wird, erschien am 21. und 22. Juli zu ihrer Gerichtsverhandlung und befand sich Berichten zufolge in schlechter physischer und psychischer Verfassung. Deshalb gibt es ernsthafte Sorgen um ihre Sicherheit. Der internationale PEN ruft zu ihrer sofortigen und bedingungslosen Freilassung auf. Außerdem fordert er die Freilassung aller Schriftsteller, die momentan im Iran einzig wegen der friedlichen Ausübung ihres Rechts auf Meinungsfreiheit inhaftiert sind. Unternehmen Sie etwas! Teilen Sie diesen Artikel bei Facebook, Twitter und anderen sozialen Medien. Rufen Sie zu ihrer sofortigen und unmittelbaren Freilassung auf und zu der Freilassung aller momentan ähnlich inhaftierten Schriftsteller im Iran, die im Zusammenhang mit der friedlichen Ausübung ihres Rechts auf Meinungs- und Versammlungsfreiheit inhaftiert sind. Machen Sie auf Artikel 19 des internationalen Pakts bürgerlicher und politischer Rechte aufmerksam, dem der Iran als Unterzeichner angehört (cm/sf). 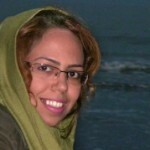 Saba Azarpeik, a leading independent journalist and political correspondent for the newspaperEtemaad and other reformist publications, has been detained at an undisclosed location since 28 May 2014, possibly in a detention centre in East Tehran. She was arrested during a raid on the office of the Tehran-based weekly Tejarat-e Farda, for which Azarpeik is a correspondent, but no formal charges against her have been made known. Since her arrest, she has been allowed to contact her family on only one occasion. On 21 and 22 July 2014 she appeared in Branch 26 of the Revolutionary court under Judge Moghiseh, and was said to be in a poor physical and psychological condition, having lost a lot of weight. There are reports that she has needed treatment for severe back pain. According to her lawyer, the hearing this week is related to a separate case which he is not involved with. She is still believed to be under interrogation and held without charge in her current case. By law, if the two cases contain similar charges, they should be merged. MP Ali Motaheri, in an interview with Iran Wire, said that according to his enquiries, it appeared Azarpeik was being held by the Office of the Prosecutor of the Media and Culture Court. Prior to her arrest, Azarpeik had reportedly written a series of articles accusing the hardline movement of trying to undermine the government of President Hassan Rouhani. Azarpeik was particularly outspoken on her Facebook page, which has been taken offline since she was detained. She had also been very active in covering the case of Sattar Beheshti, a blogger whose death in custody at the hands of the cyber police in 2012 highlighted torture and detention conditions in Iran. Azarpeik was previously arrested in January 2013 amid a wave of arrests of at least 20 reformist journalists between January and March 2013. 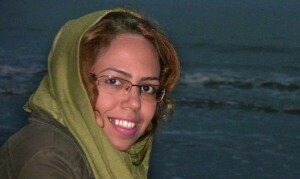 She spent some weeks in Evin prison. Well over 20 writers are currently detained in Iran for the peaceful expression of their opinions and recent weeks have seen several journalists and filmmakers arrested and/or imprisoned, including journalist Marzieh Rasouli, journalist Serajeddin Mirdamadi, filmmaker Mahnaz Mohammadi,11 staff members of Pat Shargh Govashir, a company that owns the popular Iranian technology news website Narenji and its sister sites, Nardebaan and Negahbaan, blogger Mehdi Khazali and journalist Reyhaneh Tabatabaei. Hintergrund des Verfahrens ist die Novellierung der unionsrechtlichen Regelungen über die Festlegung der Kriterien und das Verfahren zur Bestimmung des Mitgliedstaats, der für die Prüfung eines von einem Drittstaatsangehörigen oder Staatenlosen in einem Mitgliedstaat gestellten Antrags auf internationalen Schutz zuständig ist, sogenannte Dublin-III-Verordnung (Verordnung (EU) Nr. 604/2013 vom 26. Juni 2013, ABL. Nr. L 180, S. 31). In dieser Verordnung, die auf alle seit dem 1. Januar 2014 an andere Mitgliedstaaten gerichteten Gesuche um Aufnahme oder Wiederaufnahme anzuwenden ist, sind erstmals durch das Gemeinschaftsrecht auch die Voraussetzungen für eine Inhaftnahme geregelt. Danach darf eine Person zur Sicherstellung ihrer Überstellung nur dann in Haft genommen werden, wenn eine erhebliche Fluchtgefahr besteht, die Haft verhältnismäßig ist und wenn sich weniger einschneidende Maßnahmen nicht wirksam anwenden lassen (Art. 28 Abs. 2 Dublin-III-Verordnung). Die Verordnung bestimmt zudem den Begriff der „Fluchtgefahr“ als das Vorliegen von Gründen im Einzelfall, die auf objektiven gesetzlich festgelegten Kriterien beruhen und zu der Annahme Anlass geben, dass sich ein Antragsteller, ein Drittstaatsangehöriger oder Staatenloser, dem gegen ihn laufenden Überstellungsverfahren möglicherweise durch Flucht entziehen könnte (Art. 2 Buchstabe n Dublin-III-Verordnung). Unter Geltung der Dublin-III-Verordnung sind auf § 62 Abs. 3 Satz 1 Nr. 5 AufenthG gestützte Inhaftnahmen von Ausländern zum Zwecke der Überstellung in einen anderen Mitgliedstaat nun aber rechtswidrig. Denn diese Norm legt (anders als § 62 Abs. 3 Satz 1 Nr. 3 und 4 AufenthG) keine objektiven Kriterien für die Annahme von Fluchtgefahr fest und genügt daher nicht den durch Art. 2 Buchstabe n Dublin III-Verordnung gestellten Anforderungen. Das hat zur Folge, dass zur Zeit Haftanordnungen zum Zweck der Überstellung von Ausländern nach Art. 28 Abs. 2 Dublin-III-Verordnung nicht ergehen dürfen. Iran must reverse a disturbing rise in the execution of juvenile offenders with at least eight put to death in the first half of 2014. The Iranian authorities must halt the execution of a young man who was still a child at the time of his alleged crime, and reverse a disturbing rise in the execution of juvenile offenders which has resulted in at least eight individuals being put to death in the first half of 2014, for crimes allegedly committed when they were below the age of 18, Amnesty International urged today. Rasoul Holoumi, now 22, was sentenced to death in October 2010 for the alleged killing of a boy during a group-fight in 2009, when he was 17 years old. The execution could be carried out at any time at the request of the victim’s family, under the Islamic law principle of qesas (retribution-in-kind). “It is cruel and inhumane to hang any person but it is particularly reprehensible for Iran to do so when the person was a child at the time of the alleged crime, and the execution takes place after a flawed investigation process that violates fair trial standards,” said Hassiba Hadj Sahraoui, Deputy Middle East and North Africa Programme Director at Amnesty International. Iran is among a handful of countries that still execute juvenile offenders. Amnesty International has recorded at least eight juvenile executions in the first half of 2014 while it recorded none in the first half of 2013. The organization received reports of at least 11 juvenile executions for the whole of 2013. “The execution of Rasoul Holoumi will be a deplorable addition to Iran’s grim tally of executions. Whatever argument the authorities might use, this is a flagrant violation of international law. Rasoul Holoumi was a child at the time of his alleged offence and his death sentence must be quashed,” said Hassiba Hadj Sahraoui. Branch 17 of the Criminal Court in Iran’s southern Khuzestan Province sentenced Rasoul Holoumi to death in October 2010 for murder. The conviction was based on allegations that, during a fight involving multiple people in September 2009, he had thrown a hard object at Nasim Nouri Maleki, resulting in fatal head injuries. The allegations appear to have been made by several of the people who were themselves involved in the fight. Rasoul Holoumi was not given access to a lawyer during the investigation nor was he given adequate time and resources to prepare and defend himself before and during trial. Although he admitted to the charges when he was first summoned by the police, he retracted this admission after several weeks, making statements which raised doubts about the events leading to the victim’s death – or whether he was even there at the time. On 30 September 2009, Rasoul Holoumi said that he had been at home when the fight broke out and had only confessed to the crime because he felt sorry for another child who had confided to him that he had hit Nasim Nouri Maleki during the fight. On 2 October 2009, he said that he had picked up and thrown a hard object when he saw some of the people involved in the fight coming towards him, but the blow was not intentional. On 5 October 2009, he denied that he had ever thrown the hard object. Additional doubts have been raised by reports that there was a history of hostility between the family of Rasoul Holoumi and the principal witness in the case who testified against him. In spite of all this, Iran’s Supreme Court upheld Rasoul Holoumi’s death sentence in 2010 without explaining its reasoning. The Iranian authorities were due to execute him on 4 May this year, but stopped it after the victim’s family agreed to forgo their request for retribution if Rasoul Holoumi’s family paid them 3.5 billion Rials (equivalent to US$135,323) as diyah (blood money) and transferred the deeds of their house and farm to them. The diyah amount of 3.5 billion Rials appears to be beyond his family’s means, leaving the 22 year old man vulnerable to imminent execution at any time. Sentences of qesas are not open to pardon or amnesty by the Supreme Leader in breach of international law. Iran continues to be one of the world’s most prolific executing states. According to Amnesty International’s Death Sentences and Executions 2013 report, Iranian officials acknowledged the execution of at least 369 people in 2013, while reliable sources reported at least 335 additional executions. Reports indicate that at least 11 of those executed may have been under the age of 18 at the time of their alleged crimes. As of 26 June 2014, 171 executions this year have been acknowledged by the authorities or state-sanctioned media and at least 233 additional executions have been reported by other reliable sources. The execution of people for crimes committed when they were under 18 is strictly prohibited under Article 6 of the International Covenant on Civil and Political Rights (ICCPR) and Article 37 of the Convention on the Rights of the Child, both of which Iran has ratified. Under Article 6(4) of the ICCPR, anyone sentenced to death shall have the right to seek pardon or commutation of the sentence. HRANA News Agency – Seyed Bibi Rasoulizadeh (Moradkhatoon), in Sarbaz town, was taken over by police when she was resisting against seizure of her nephew’s car and died in the way to hospital. According to the report of Human Rights Activists News Agency (HRANA), police seized a Toyota car, in a checkpoint on Sarbaz town, the suburb of Ashar in Afshan village, which was carrying diesel fuel and belonged to the nephew of Seyed Bibi Rasoulizadeh, on Friday, July 18th at 12am. When this 40 years old woman tried to prevent seizure of the car she was taken over by the police officer who was driving and died on the way to hospital due to the injuries. An informed source told HRANA’s reporter, “when police officers were trying to transfer the car to station, they confronted with her. Moradkhatoon insisted that they should not seize her nephew’s car. But, the officer who was driving had taken over her”. This source also said that officer was a conscript and he even did not stop for transferring her to hospital. This incident caused anger of the community and some had attacked the station and broken the door. Poverty and unemployment have caused the young people tending to smuggling the fuel to neighbor countries. 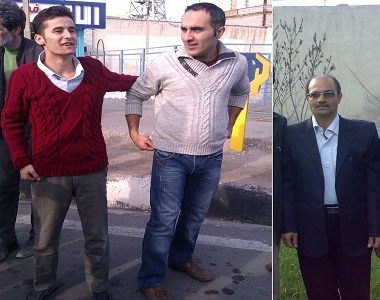 HRANA News Agency – Three Azerbaijani activists have been sentenced to 7 years imprisonment by a court in Tabriz. According to the report of Human Rights Activists News Agency (HRANA), Rasol Razavi, Hossein Ali Mohammadi and Taha Kermani, three Azerbaijani civil activists were sentenced to 7 years in total by a court in Tabriz. Judge Bagherpour the head of the third branch of the Revolutionary Court in Tabriz sentenced Ali Mohammadi and Kermani on charge of propaganda against the Regime and insulting the Supreme Leader to endure three years imprisonment for each of them, and also, Rasol Razavi on charge of propaganda against the Regime to one year imprisonment. .
“The destruction of public property and sacrilege” is also two other alleged charges that Ali Mohammadi and Kermani have faced. On 6th August they will be presented to defend themselves at Tabriz Revolutionary and General Court, Branch 104. Indeed, Hossein Ali Mohammadi and Taha Kermani on 4thNovember 2013 and Rasol Razavi on 4th December 2013 were detained by Tabriz security forces and after several months were released on high bails. 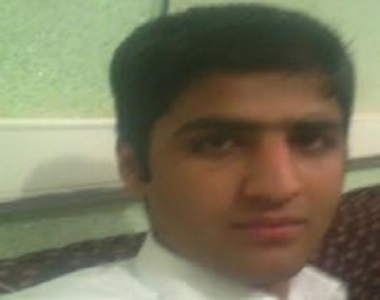 HRANA News Agency – Iran’s Ministry of Intelligence has prevented the release of the child of a Sunni prisoner who has been held for three years without sentence, despite being granted release on bail by the courts six months ago. According to the report of Human Rights Activists News Agency (HRANA), Abdollah Abadian, the son of Sunni prisoner Malek Mohammad Abadian, was arrested at the age of 16. He has been detained without sentence for the past three years in the Ministry of Intelligence detention center and in the Central Prison of Zahedan, southeast Iran. Despite being granted release on bail by the courts six months ago, the Ministry of Intelligence objected to the decision and prevented his release. His father, Sunni prisoner Malek Mohammad Abadian, is facing the death penalty along with several other Sunni activists following the death of a pro-government cleric who was killed by unknown men in the Sistan-Baluchistan province. The men, who were subjected to torture in detention, pressurized to make false ‘confessions’, and deprived of a fair trial, have denied the charges. 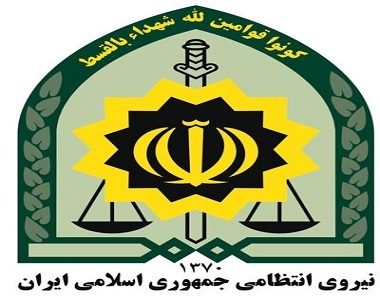 Two more of Malek Mohammad Abadian’s sons were arrested in addition to Abdollah Abadian. Sources say the children were arrested in order to pressurize the father into making false ‘confessions’. ausgehandelte „Einigungspapier Oranienplatz“ torpedieren. Das Gutachten ist aus sozial- und aufenthaltsrechtlicher Perspektive sehr spannend, weil es schön aufschlüsselt, welche aufenthalts- und sozialrechtlichen Probleme sich für die einzelnen Statusgruppen der protestierenden Flüchtlinge ergeben. „Der iranische Regimekritiker und Menschenrechtsverteidiger Ahmed Zeidabadi setzt sich seit vielen Jahren trotz massiver Repressionen für die Einhaltung der Menschenrechte in seinem Land ein. Er wurde zu lebenslangem Berufsverbot und einer sechsjährige Haftstrafe verurteilt. Aus diesem Anlass fordern wir von Teheran erneut die Freilassung aller politischen Gefangenen sowie die Einhaltung der menschenrechtlichen Verpflichtungen und essentiellen Bürgerrechte, die sich für den Iran als Vertragsstaat des UN-Zivilpaktes ergeben. Trotz anderslautender Ankündigungen von Präsident Hassan Rohani kurz nach seiner Wahl vor einem Jahr verletzt der Iran nach wie vor massiv Menschenrechte. Die Bilanz des Landes in Sachen Menschenrechte ist und bleibt erschreckend. Die Zahl vollstreckter Todesstrafen war auch im Jahr 2013 unvermindert hoch. Die Gefangenenhilfsorganisation Amnesty International geht von mehr als 700 Hinrichtungen aus, die zum Teil öffentlich durchgeführt werden. Die Dunkelziffer ist hoch; auch Minderjährige werden hingerichtet. Ethnische und religiöse Minderheiten sind regelmäßig Opfer staatlicher Unterdrückung. Besonders betroffen sind die Bahá´i sowie Christen und Konvertiten, die den islamischen Glauben ablegen und zu einer anderen Religion wechseln wollen. Der Pressefreiheitsindex von Reporter ohne Grenzen weist Iran in diesem Jahr Platz 173 von 180 zu. Unabhängige Berichterstattungen über Menschenrechtsverletzungen sind danach beinahe unmöglich.